The Hyatt Regency Churchill Hotel has a traditional feel and sits on the north west edge of London's West End. Suited as much to the leisure guest and tourist as it is to the business guest. The Churchill Hotel is one of the longest established central London 5 star hotels with an international reputation. The hotel enjoys views over leafy Portman Square, a major arterial junction for London and the West End. A luxury hotel for the modern age and enjoys bedrooms featuring the latest high tech amenities. There are dedicated Club floors (7th, 8th, 9th) where guests benefit from a private concierge, use of the boardroom and access to family and business Club Lounges. Bedrooms have individual air-conditioning controls and facilities include 40 inch flat screen TV with videos on demand, tea/coffee tray (Jacob Jenson kettle), safe, Direct dial telephone 2 lines and voicemail, desk, iron and ironing board, Dual voltage power points, High speed internet access (wired and free wireless), Minibar, iHome Docking Station, Radio & Alarm. Beds have quilted duvets. The rooms all have en-suite facilities with Hi-Tech Toto toilet, marble baths, bathrobes, phone and hairdryer. Most rooms have a walking jet shower while some have a bath and shower. Standard bedrooms are contemporary but classically British in style. Windows can be opened. Club rooms have their own dedicated and private floor. These rooms are classically English in deign. You get all the standard amenities (larger TV) plus facilities such as a trouser press, mineral water and fruit, personal conceirge and luxury toiletries (Molton Brown). The two Regency Club lounges offer complimentary continental breakfast, all day tea, coffee and light snacks and evening cocktails and canapés. The Regency Suites are also traditionally English and feature larger rooms (53 sq metres) with a separate bedroom and a walk-in shower. Access to the Regency Club lounge and all the benefits of Club rooms. These rooms also have a balcony (suites on 9th floor). Newspaper are available on request. There is a nightly turndown service and room service operates 24/7. Two rooms are adapted for accessibility. These rooms are close to fire exits and have lower than normal beds and assistance alarms among the facilities. In-room massage service available for all room types. Dining options: Locanda Locatelli: Opened by Italian chef Giorgio Locatelli and designed by David Collins is this 90 seat family run (Giorgios wife runs the front of house) Italian restaurant. The dishes highlight the natural flavours and quality produce from Italy and the wine list is exclusively Italian. There is a particular emphasis on fresh pasta and a variety of regional Italian breads, all of which are made daily onsite. The Montagu: - Pretty indoor garden terrace setting, complete with two life-size trees and located on Portman square. The setting has a vibrant feel. This buzzing restaurant offers a wide range of British and European seasonal dishes, all of which are prepared using the finest seasonal ingredients. A feature of the restaurant is the open kitchen. At the Montagu restaurant you can choose a full meal or just a snack or a cup of tea. Serves breakfast, lunch and dinner. Diners at the chef's table are treated to tasting dishes presented by the chefs themselves. For each reservation the chef will create a five course dinner highlighting the menu from The Montagu. Using seasonal ingredients and taking the best of that days deliveries, the chefs will create a unique meal for every reservation. Each guest is offered a glass of champagne on arrival served at The Montagu bar. This service is open to groups of 5-9. Open 06.30 (07.00 weekends) till 22.45. Afternoon tea is served 15.00 till 18.00. Churchill Bar and Terrace: Books written by Winston Churchill are displayed in the club. The former world war II prime minister stayed at the hotel that the bar and hotel are named after him. Not just the books but several contemporary touches in the bars design reference to Winston Churchills life in photography and art, in love and lifestyle and in travel and animals. Guests can enjoy classic cocktails, fine wines from the great Maisons and artisanal producers and a selection of cigars for smoking on the terrace. The cocktail list has a strong identity with its own Churchill Craft Gin, heavy in juniper and citrus, home-made tonics and classic cocktails with a truly British legacy using the finest spirits. Signature cocktails include the Churchill Martini, using the bars bespoke London gin, the Ale Flip and T & Tonic. International classics such as Sidecar, Clover Club and Bobby Burns also feature. The bar also serves British themed dishes throughout the day, using Churchills favourite ingredients such as Loch Fyne smoked salmon, steak tartare, welsh rarebit and rock oysters. A selection of cigars, housed in a bespoke dark stained oak humidor made by DeArt, are available for purchase. The terrace features a specially commissioned life-size bronze of a young Sir Winston Churchill entitled “In Conversation”. The bar has its own entrance on Portman Square. Open: noon till 02.00 (till 01.00 Sunday). Business travellers will be glad to know that the Hyatt Regency Churchill hotel has a dedicated business centre. Here you can make use of a whole selection of services that includes the hire of computers installed with office software, fax and copy facilities, secretarial services, mobile phone hire, stationary and laptop hire. To gain access to the centre you must obtain a pre-pay access card from the front reception. There are also 12 meeting/conference rooms which have wired high speed internet access and high tech AV equipment. Maximum capacity in the largest room is 300.
Leisure facilities include the 24 hour Churchill Health Club which is open exclusively to hotel guests (access by your room key-card). The air-conditioned gymnasium has a good range of equipment that includes rowing, cycling and treadmills. The spa area includes a sauna. The hotels public areas have a WiFi internet connection. You can download the Churchills own app for both ios and android. Additional hotel services include Laundry, high end gift shop, hair salon, valet service and outdoor floodlit tennis courts (offsite, located in centre of Portman square). The Hyatt Churchill Hotel does not permitting smoking in any of the hotel including bedrooms. Nearest: Tube Station: Marble Arch 264 yards (241 metres), Railway Station: London Marylebone 0.6 miles (1 km), DLR Station: Tower Gateway 3.6 miles (5.7 km), Motorway: M1 Junction 1 5.1 miles (8.2 km). The Hyatt Regency London Churchill Hotel is located on the northern edge of central London yards from Oxford Street. One of the busiest shopping areas in Europe Oxford Street is a mecca for the London tourist. The general emphasis on the area is slanted very much to the tourist with many opportunities to buy souvenirs of your trip. The hotel is actually on a busy Square, used by through traffic and where you will always be able to find a London taxi. Across over the street and you find yourself in Mayfair. Not just the most expensive street on the UK monopoly board but one of the more exclusive areas in the UK. Home to the mega rich and to intentional companies keen to make use of such a prestigious address. Within Mayfair are well known shopping streets such as Bond Street for fashion and jewellery and Saville Room for the best in designer suits. Just 300 yards to the west finds Marble Arch and Hyde Park. One of the most popular parks in London and with enough to do to keep the whole family entertained for the day. Just 0.5 miles to the North is another big park and home to London Zoo, Regents Park. Marble Arch is also the start of Edgware Road which has a large number of shops and restaurants geared to the middle eastern visitor. Just to the north of the hotel is Baker Street, made famous by the Sherlock Holmes novels. At the top of the street you will find the Sherlock Holmes museum. The hotels location makes it ideal for a London stay giving good access to all the central areas and being close to a whole variety of amenities. Some of the nearest places of interest include the Wallace Collection (0.2 miles), Speakers Corner (0.2 miles), Selfridges department Store (0.2 miles), Wigmore Hall (famous classical concerts venue) (0.4 miles), and Madame Tussauds (0.5 miles). Andaz Liverpool Street: is 3.2 miles (5.2 km) away, has a guest satisfaction score of 90% and rates start from about £161. Compared to other London hotels: This hotel has been rated 89% by past guests. The London average is 80% and the average for 5 star hotels is 89%. Therefore this hotel is equal to the average for its sector (star rating) . Hyatt Hotels across the chain average 89% so this hotel is rated as average when compared to other Hyatt hotels. Milesfaster ranking: 116th from 866 London hotels, 2nd of 2 Hyatt Hotels, and 54th of 131 five star rated hotels. Another to Consider: A similar hotel nearby (0.1 miles, 0.1 km) would be the 5 star Grange City Hotel, where rates start from £111 and which has an 82% guest satisfaction rating. We can also point you towards a lower price option, the Re Shoreditch Hotel. 1.6 miles away (2.6 km), achieving a rating of 74% by its past clients with base rates starting at about £67 (theres free WiFi too). 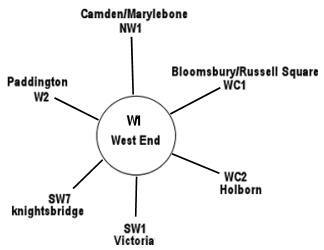 The 50 hotels nearest to this location (30 Portman Square, W1 postcode) that we list cover a 0.7 miles (1.1 km) radius. They breakdown as follows: 19 five star hotels (average rating 89%), 23 four star hotels (average rating 81%), 6 three star hotels (average rating 75%) and 2 two star hotels (average rating 61%). Overall the best rated hotel is The Beaumont London (5 star) at 99%. Of the 50 local hotels we have base rate data for 49 of them. The average starting rate looking at all the nearest hotels to this location is £237 per night. The cheapest standard rates begin at £49 at St George Hotel (3 Star, 61%) while the highest base rates are £1000 at 45 Park Lane Hotel (5 Star, 98%). Averages listed for each individual star sector: Five Star average: £387, Four Star average: £162, Three Star average: £66 and Two Star average: £67. Using our in-house algorithm we rank hotels based on guest ratings and weighted for related factors we rank Churchill Hotel (Hyatt Regency London) 14th (joint) of 50 area hotels and 11th (joint) for the 19 five star hotels in the area. We rank the hotel 39th of 49 (9th of 19 five star hotels.) for base rates. We rank this hotel based on rates and also review scores to place it 16th of 47 of all the closest hotels in terms of value for money (The Arch Hotel was top). Re-opened in January 2017 after a multi million pound refurbishment. A gas explosion on 22nd November 2014 blew in a hole in the side of the hotel. 14 people were reported to have suffered injuries. The hotel closed for repairs till March 16th 2015. Multi-million pound refurbishment 2010/2011 improving the hotel bedrooms including the Regency and Regency Executive suites on floors 7,8 and 9. A second Regency Club Lounge was created along with 6 new suites. Overall Bedroom Numbers dropped by 10 from 444 to 434. Multi-million pound refurbishment 2006/7. £8 million pound refurbishment in 2001. Awards: Locanda Locatelli restaurant is a Michelin star holder. 2007: silver/runner-up top large hotel.